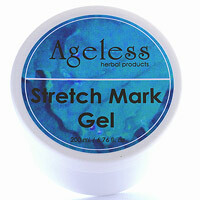 Stretch marks treated with Ageless Herbal Stretch Mark Gel (not a cream). Our herbal Stretch Mark Gel is specially formulated to prevent stretch marks forming when pregnant, during weight gain or if you are growing fast or busy bodybuilding. The herbal extracts are also selected to help repair any stretch mark damage already evident on your skin, and to minimize these unsightly scars. This formulation is based on a herbal formula developed and tested by Prof. Chastrusse and other doctors of the Central Hospital, Pellegrin-Tondu, which achieved great results. Chastrusse L, Soumireu-Mourat J, Ambonville C, Hourcabie J., Phytolastil in the treatment of weals of gravid origin - (in French), J Gynecol Obstet Biol Reprod (Paris). 1976 Sep;5(6):848-9. In some people, existing scarring may not be totally removed, but the stretch marks will improve with our product. The above does not show severe stretch marks, and far worse looking stretch marks have been made less visible with our very effective stretch mark gel. From these studies you will note that our claims are not hype, but like the rest of our range, rely on excellent products backed by years of research. We took this formulation and improved on it, and added other ingredients to support the collagen and elastin in your skin, to prevent stretch marks and to help heal ones already formed. An interesting observation: you also need vitamin C in your body for collagen to be formed, and we have found that our clients achieve far better results if they also take vitamin C capsules or pills at the same time as applying our Herbal Stretch Mark Gel. Our Stretch Mark Gel has an unique and extraordinary formula, in which a blend of various pure herbs and natural ingredients are combined to create this remarkable product. It contains the following herbs and natural ingredients: butcher's broom, calendula, centella, chickweed, ginseng, green tea, hibiscus, horsetail, ivy, lady's mantle and marshmallow. To place these herbs in perspective, and the reason for their inclusion in our Stretch Mark Gel, we have included a short summary of each ingredient used. For more information on each individual ingredient, please click the hyperlinked text. It has excellent anti-edema and anti-inflammatory effects, due to the a-adrenergic stimulation of the blood capillaries. Application of it stimulates the cutaneous circulation, which makes it suitable for any application where water retention and a slow lymph flow is present, and it can be used on ultra-sensitive skin. It is a botanical compound that is often used, as it has excellent properties for skin care and helps with cell rejuvenating, wound healing, reducing inflammation and soothes and softens the skin. Calendula is particularly helpful with cracked and damaged skin and has a humectant action on the skin, which helps with dry and dehydrated skin, while the cell rejuvenating properties are most useful in older as well as damaged skin. It is high in saponins which have a healing and soothing effect on the skin and is used with great success on rashes, itchiness, eczema, psoriasis, hemorrhoids, varicose veins, inflammations and other skin complaints. The vulnerary properties of this herb help to prevent tissue degeneration and helps to arrest bleeding in wounds. One of its main actions is to prevent collagenase (destruction of the collagen) in the way it stimulates protein synthesis and inhibits proteic enzymatic degradation in the fibroblasts. The plant is also responsible for increasing phospholipids synthesis in the blood. Studies have shown that it also has a strong anti-oxidant effect - thereby neutralizing free radicals, which is more considerable in derivatives of protapanaxatriol than in other fractions of the plant, and it acts by optimizing the cutaneous metabolism of the whole body. It is specifically helpful in capillary products, to stimulate growth and increase tensile strength. It has three major benefits – Firstly, it is a powerful antioxidant, thereby reducing free radical damage in the skin. Secondly, it is a potent anti-inflammatory agent, thereby reducing inflammation in the skin. And thirdly and most importantly, it has an inhibitory action on collagenase (an enzymatic action in the skin, where the collagen is broken down), resulting in firmer and more elastic skin. The flavonoids and catechols in green tea provide it with vitamin P properties. The tannins in its chemical composition give it astringent properties, whereas the polyphenolic compounds act as an astringent, also protecting the skin, causing vasoconstriction and reducing inflammation in the affected area. 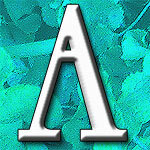 Cell regeneration is caused, as well as a wound healing activity. It contains a host of beneficial compounds, but in essence it acts on the horny layer of the skin to reduce the cohesion between the corneocytes, which affects the thickness of the skin and also increases skin moisture. Hibiscus also contains anthocyanocides, which have astringent, anti-inflammatory, antioxidant (free radical scavenging activity) properties, as well as inhibition of the enzyme that causes elastase and hyaluronidase, while at the same time enhancing the retention of the skin’s hydric content. It is an extraordinary re-mineralizer of the skin and has haemostatic properties, providing natural silica to the skin. The flavonoids and saponins in horsetail have great cell rejuvenating and regenerating properties and also have a stabilizing effect on the connective tissue, thereby increasing the firmness and elasticity of the skin. Its extraordinary effect on the skin even prompted the Commission E to approve it, as treatment for wounds. It is the flavonoids that are responsible for its unique wound healing and tissue repair actions. Extracts of the wood are mostly used in cosmetics and for external use, for healing skin as well as treating burns, warts, impetigo, skin eruptions, neuralgia, swollen joints, and cellulite. It has topical anti-fungal, molluscicidal, anti-mutagenic, as well as anti-inflammatory properties. Its other major topical action is that of being a circulatory compound, which helps other ingredients to be absorbed by the skin, as well as assisting with the removal of waste products from the skin. It furthermore has an astringent effect on the skin, and helps to protect the elastin fibers, which are extremely thin - between 1 and 3 Tm in diameter. Elastin is required for skin elasticity, and is a protein in the skin, which together with collagen and glycosaminoglycans, make up the connective tissue. All these elements originate in the fibroblast. It has very beneficial effects on skin problems and diseases and helps in healing wounds, burns and irritation. Marshmallow not only has good anti-inflammatory properties, but also seems to boost immunity at cellular level. It also has an inhibitory effect in hyaluronidase, which is an enzymatic action in which the hyaluronic acid and other muco-polysaccharides in the connective tissue are degraded. An inhibition and reduction in hyaluronidase leads to better moisture levels in the skin, as well as boosting the dermal structure and improving wound healing processes, while at the same time reducing skin aging and diminishing inflammation. 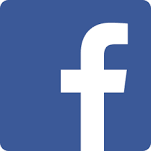 For the full list of ingredients, as per INCI specifications, please click here. 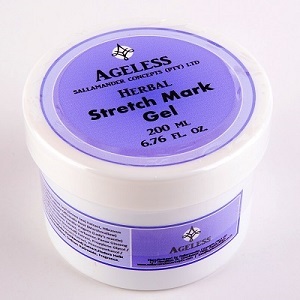 Apply the Ageless Herbal Stretch Mark Gel twice daily to the affected areas. I would just like to give you some positive feedback on your Stretch Mark Gel. When my wife became pregnant she was an A cup and soon bloomed to a C cup. She had been using a different cream to try and prevent stretch marks, but they started to form anyway. I am a doctor and she asked me for my help. 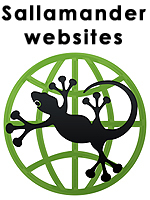 I search the web and found your site. I chose your Stretch mark gel for several reasons. First it contained an ingredient, organic silicon which has been proven in clinical trials to heal and diminish scars. And second, you were the only site to dare to show reports of clinical trials of your product. Anyway, she used your product twice a day and did not develop any more stretch marks and even showed significant reduction in the size of the existing marks. She also used it on her abdomen, which had not developed any marks and it kept her from developing any at all there. She is going to continue to use the Stretch mark Gel on her breasts to help fade the few marks she developed prior to using your product. Hi. I just placed an order for another tub of your stretch mark gel. I have to tell you when I found your site through my search I was so extremely overwhelmed with happiness - but it did not equal my emotions when I started to see the results of the product. I'm only seventeen years old and I have purple/red stretch marks all over. It has been the cause of a lot of depression in my young teenage years. Especially since I didn't always have them. I started to notice them after I began playing volleyball in school. I was doing stretched that my body was never used to and at the same time I was also gaining weight. I've always been slightly over weight but never did I ever imagine that such ugly marks would prevent me from wearing shorts and tank tops. The stretch marks all developed under my arms and behind my knees. I also have some on my hips and breasts. Easy to use and economical, as only a small amount is required. No oily or sticky residue. Unique selection of botanical ingredients to create the best stretch mark gel in the world. Natural - so no harsh chemicals to irritate or burn the skin. Helps to rejuvenate and regenerate the skin. Prevents stretch marks and also reduce already formed stretch marks. Proven over years of use and trusted by people that have already tried it.